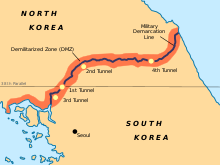 ^ The MDL was defined and established in the Korean Armistice Agreement (KAA), Article I, paragraphs 1–11. The KAA includes provisions regarding the MDL and DMZ; but those provisions do not extend into the Yellow Sea or the Sea of Japan. The subsequently devised Northern Boundary Line or NLL 互联网档案馆的存檔，存档日期2012-03-11. was neither initially conceived as part of the MDL, nor have the DPRK and UNC agreed to any subsequent extension of the MDL beyond the agreed upon limits of 1953/7/27. ^ Ryoo, Moo Bong. (2009). "The Korean Armistice and the Islands," p. 5. Strategy research project at the U.S. Army War College; excerpt, "Strategic Consequences of the Agreement. The agreement to retain the five islands under UNC control has shaped many aspects of the security environment of the Korean Peninsula. The most obvious and prominent consequence is the establishment of the Northern Limit Line (NLL). The NLL has served as a practical maritime borderline and an effective means to separate the forces and thus prevent military clashes between th two Koreas"; compare Kim, Kwang-Tae. "After Exchange of Fire, N. Korea Threatens More Strikes on South," 互联网档案馆的存檔，存档日期2010-11-26. Time (US). November 23, 2010. ^ Pak, Hŭi-gwŏn. (2000). The Law of the Sea and Northeast Asia: a Challenge for Cooperation, p. 108, p. 108,於Google Books。; excerpt, "Under the 1953 Armistice Agreement, the Military Demarcation Line was drawn across the Korean peninsula. Since no maritime demarcation line was specified in the Armistice Agreement, however, the United Nations Command drew the NLL...."
^ 纪念朝鲜人民军建军十周年. 人民日报. 1958-02-08 [2012-06-22]. （原始内容存档于2015-07-22）.